December 11, 2012 - American Airlines today takes delivery of its first Boeing 777-300ER (Extended Range) aircraft, another step in its plan to create the industry's most modern fleet. American is the first U.S. airline to order and take delivery of the Boeing 777-300ER, which will give American's fleet additional network flexibility, while delivering increased efficiency and better operating economics. The 777-300ER ("ER" for Extended Range) is the B-market version of the −300. It features raked and extended wingtips, a new main landing gear, reinforced nose gear, and extra fuel tanks. It also has a strengthened fuselage, wings, empennage, and engine attachments. The standard GE90-115B turbofan is the world's most powerful jet engine in service, with a maximum thrust of 115,300 lbf. Its maximum range is 7,930 nautical miles (14,690 km), made possible by higher MTOW and increased fuel capacity. The −300ER can fly approximately 34 percent further than the −300 with a full load of passengers and cargo. Following flight testing, aerodynamics refinements have reduced fuel burn by an additional 1.4 percent. "This is an important step in demonstrating how American is focused on putting our customers at the center of everything we do," said Virasb Vahidi, American's Chief Commercial Officer. "This aircraft will deliver a new level of comfort, connectivity, and convenience for our customers. We are especially pleased to be among the first in the industry to offer a combination of fully lie-flat seats with all-aisle access, international Wi-Fi, and state-of-the-art in-seat entertainment." American's 777-300ER, delivered today without the traditional American livery, marks the beginning of the airline's brand new fleet type and points toward the airline's future. 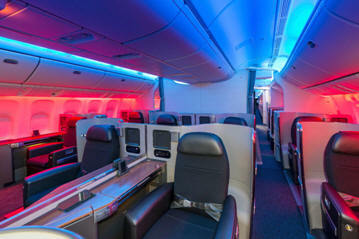 Inside, the cabin is configured with three classes, featuring lie-flat seats in First and Business Class. "This delivery demonstrates American's commitment to transforming its fleet into one of the youngest and most fuel efficient in the industry," said John Wojick, Boeing's Senior Vice President of Global Sales for Commercial Airplanes. "The 777-300ER is an ideal airplane for American's fleet renewal effort providing unparalleled operating economics, long-range capability, reliability and passenger comfort." The Dallas/Fort Worth-Sao Paulo route, scheduled for Jan. 31, 2013, will be the first to feature the newest addition to American's fleet. Subsequently, the aircraft is slated to fly to London Heathrow from both Dallas/Fort Worth and New York JFK. The modern new aircraft will feature a freshly painted livery on the outside. Upon boarding, American customers will be invited inside through a dramatic archway and ceiling treatment and mood lighting, to continue the modern experience and the look and feeling of spaciousness. A walk-up bar in the premium cabin stocked with snacks and refreshments will be a first for any U.S. airline and adds another distinctive luxury feature to the 777-300ER. Entertainment options include up to 120 movies, more than 150 TV programs and more than 350 audio selections that will be offered throughout the aircraft. Also, every seat will feature individual 110-volt AC power outlets and USB jacks for charging personal electronic devices.